The Red Cross Hospital was opened in Klaipėda on S. Nėries Street 3 (former Bahnhofstrasse 13/15) in 1933. In 1931, the Lithuanian Red Cross Society, urged by its Chair Dr Rokas Šliūpas, decided to establish a hospital in Klaipėda. The hospital was designed by the engineer Rytis Steikūnas, while its construction was funded by the Lithuanian Red Cross Society. The first director of the hospital was Dr Juozas Ciplijauskas (1887–1943). The hospital had 100 beds in 3 departments: internal diseases, women's diseases and surgery. 1936 marked the establishment of ENT (ear-nose-throat) department and a dispensary. The hospital employed 12 doctors, as well as 20 nurses and obstetricians. As of 1934 the hospital hosted nursing courses. The hospital was constantly overloaded with 140–160 patients. This prompted the construction of the fourth floor of the treatment bloc in 1938, which was left incomplete: in 1939 Klaipėda region was annexed by Germany and soon the hospital was closed. During the years of the World War II the building was used as a lazaretto for sailors. During the war the building was severely damaged, with the medical equipment destroyed or stolen. 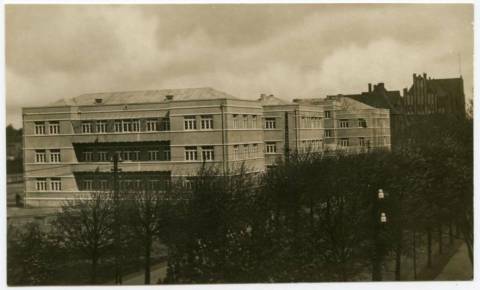 In 1945 Dr Alfonsas Dirsė organised the reconstruction of the hospital under difficult post-war conditions. The renewed 50-bed hospital was opened already at the end of 1945. The writer Ieva Simonaitytė, who lived in Klaipėda in 1921–1938, was also treated at this hospital numerous times. At that time the hospital was led by the director J. Ciplijauskas. Currently the building hosts Klaipėda State Hospital (the title was changed in 2010).